R Kumar & Company is your reliable provider of a wide range of eco-friendly bags including Jute bags, Cotton bags, Promotional bags, and Canvas Bags. As a leading designer, manufacturer, and supplier of eco-friendly bags and accessories, we are committed to making superior quality jute and cotton bags and accessories available to our customers all over the world. We remain your dependable manufacturer of Jute and Cotton bags that possess the required international presence and years of experience to capitalize on different opportunities in developed and emerging markets in different parts of the world. Today, R Kumar & Company has strong recognition and presence in over 20 countries in different continents across the world. With a well-established global presence outside India, we maintain a network of local businesses and offices serving customers in North America, Europe, Africa, Asia Pacific regions, and the Middle East. 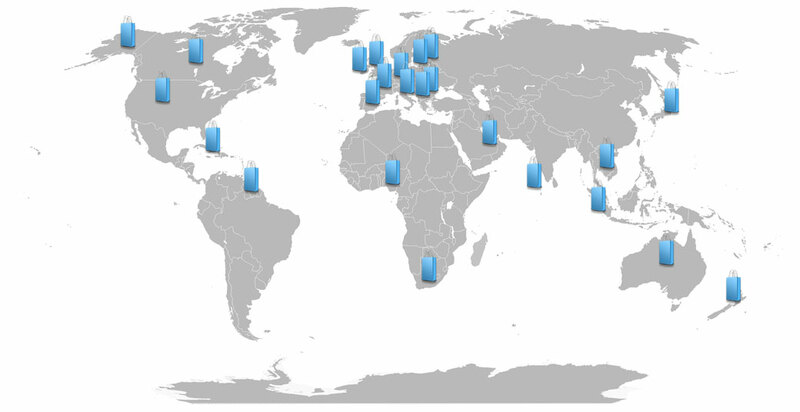 We have expanded our reach to a host of countries including the United States, Australia, France, Hong Kong, Japan, Canada, Germany, Nigeria, United Kingdom, Russia, South Africa, Singapore, and so forth. Our ability to deliver superior quality, eco-friendly jute and cotton bags and accessories have made our products the preferred option for a lot of customers in these countries. At R Kumar & Company, we support a broad range of customers in developed and emerging markets across the world. Our customers include leading Wholesalers, Importers, Stockists, Retailers, Wineries and Breweries, Food & Beverage Companies, Chain Stores, Departmental Stores, Cosmetic Brands, Health Resorts, Hotels, and so forth. With the help of our customers, we continue to deliver quality products and services to help meet the bag needs of individuals in their countries. Our wide range of eco-friendly bags including Jute bags, Cotton bags, promotional bags, and wine-bags are now widely accepted in different parts of the world.